I create individual originals for original individuals….are you one?!!! 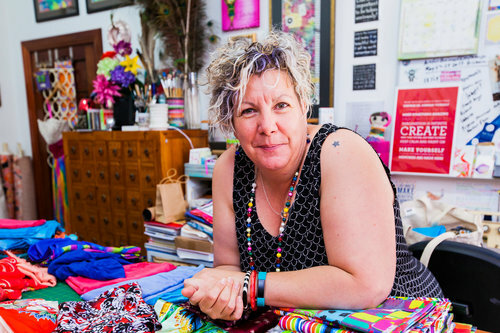 I am a textile and collage artist, designer, dressmaker, collector, upcycler, creator and teacher in the lovely seaside town of Port Lincoln in South Australia. I run my business, COLORS australia, in my colourful light-filled home studio, with adjoining showroom space used for fittings and display/sales of my art. I create art-to-wear clothing, homewares, jewellery, artwork, artisan gifts and cards. All unique one-of-a-kind pieces, using my passion for colour, textiles and collage. I sell directly from my studio, at select galleries and markets, my website shop page and my ETSY shop. I also create custom made pieces for select clientele, please get in touch so together, we can make your ideas come to life! Having trained in fashion, I continue my life long love affair with textiles and sewing. Using constant experimentation, research, travel and sourcing to come up with new ideas. I am also now teaching dressmaking and art/craft classes/workshops, passing on my skills and passion to eager participants. I enjoy bringing an environmental awareness and eco-friendly aspect to my work. An avid collector of textiles…past and present, near and far. Found objects and recycling/upcycling feature heavily…in particular vintage kimono fabrics, tablecloths, doilies etc in my clothing and homewares. As well as paper, feathers, ephemera etc in my collage pieces. This brings the feeling of SLOW fashion and sustainability to my work. I also like to use beautiful multicultural textiles eg. Indonesian batiks and handwoven ikat fabrics, Japanese kimonos, African and South American handwoven striped cottons, etc. I enjoy telling the story behind the materials used in each piece. My inspiration comes from many places and things…rainbows, spirals, feathers. Alice in Wonderland & Dr Seuss. Leaves, shells, birds and fish. Buddhism and other religions. Far away exotic lands, to our local beaches and many places in between. Some full of insight and meaning. Some more playful and whimsical. And sometimes it’s simply a beautiful piece of fabric that inspires the work. Positive affirmations and symbolism are a big part of my life, so I extend these into my art. I encourage people to be the best version of themselves that they can be… as unique, colourful and fabulous as possible. Pursue your dreams and live an amazing life. My art pieces carry a message of hope, good luck and peace. Please enjoy them as much as I enjoy creating them. Treat yourself and your loved ones to special handmade pieces (whether from me or other artists around the world) and support those artists as they keep our world creative, colourful and alive!! Smile, relax and remember to breathe.